You will get 3 Gingerbread Men Melts totaling 8 oz. of wax. These adorable melts will come packaged in a cute bakery bag with window tied with homespun. Available in all our amazing fragrances. 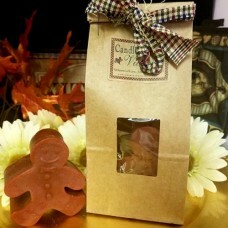 The Gingerbread Men Melts will always come in the color brown no matter the scent choice.